The Star Trek universe overflows with subatomic particles and energy sources of all kinds, from both natural and artificial sources. Characters who go into space (especially in Starfleet) seem to run into these wild phenomena on a regular basis. Accordingly, part of the fun of being a Starfleet character in the Star Trek universe must, I think, be to get to interact with these phenomena. Starfleet characters should have tools allowing them to find ways to detect these various phenomena, to figure out what they signify, and to produce other effects that protect from or counteract encountered phenomena. So I thought it might be fun to collect information on the various sorts of physical effecs that Star Trek characters have run into, and to see if I could define some of the tools and processes by which players of Star Trek Online might detect and interact with those effects. This document is the result of that research and development. Something I realized early on was that an attempt to define all the tools that have showed up in Star Trek would take more time than even I have! So to give this review a workable focus, I've limited it to the use of sensors. In what follows, I'll list the phenomena that have been mentioned in the Star Trek universe, and I'll describe the tools and processes used to observe and affect those phenomena. As a result, there's no department-specific emphasis here. Science, Medical and Engineering players won't find a complete list of every tool they could ever hope to use, or every game function they could ever perform. But they will find tools and a limited set of processes for using a starship's sensors to detect the many particles and energies in Star Trek. The second part (starting at "Sensor Operations in Star Trek Online") is the juicy bit -- this is where I get into a set of concrete suggestions for how a player might use sensors on board a ship in Star Trek Online. It's not intended to be a hard-and-fast, This Is How It Must Be kind of thing; it's more of a collection of ideas that are meant to stimulate discussion. Feel free to chime in with comments, pro or con. If you like the ideas, feel free to say so! If not, how would you improve it? How would you make using sensors more fun? With that, I give you what I've been working on for the past several months. Enjoy! It took a while to track down all the references and figure out all the uses, but eventually I was able to come up with a list of most (though probably not all, which is sort of terrifying) of the phenomena encountered in the world of Star Trek. In each group I list the name of the phenomenon, its class and type, whether it's a naturally-occurring thing or can only be produced by artificial means, and the most frequent ways in which these phenomena are encountered (which in most cases means how they're produced and used). A complete game system would take these uses and turn them into gameplay encounters -- I don't go that far in this document or I'd still be writing it two years from now! But I thought they might be worth documenting for others to use, so here they are. Note: Although particle and energy emissions have their place in scientific, engineering, and medical applications in Star Trek, in a gameplay-heavy Star Trek MMORPG it's likely that emissions will generally be a Tactical function. So I won't go into too much detail on how these might work -- this document will focus more on how sensors might be used to collect information. In particular, one of the most powerful and versatile of all emitters is a starship's main deflector dish. A highly sophisticated instrument capable of emitting an extremely wide array of both energies and particles, the main deflector is normally used to project a subspace force field around a starship. This serves both to deflect small particles that would destroy a ship at high speeds, as well as to provide a basic level of protection from various forms of radiated and projected energies and particles. An additional use for the deflector is to emit energies and particles of various types and forms for scientific or tactical purposes. Energy may be sent through the deflector dish in pulses or as a collimated beam, both of which may be directed toward a position forward of the ship. For energy field effects, the deflector dish can operate as a field emitter capable of surrounding the entire ship in radiative energies of various kinds. Energy emitted by the deflector dish may be modified by power level or frequency modulation. The dish is also capable of emitting energies of multiple types and frequencies simultaneously to achieve harmonic effects. Special short-lived, high-energy particles generated by a superluminal accelerator coil integrated into the deflector system may also be emitted by the deflector dish, typically as either a pulse or a beam directed at a position near the front of the ship. Some examples of the energies and particles emitted by devices seen in various episodes of Star Trek might be instructive. I'll list some uses of the main deflector dish first, then a few of the other devices we've seen employed. Detectors come in two main types: sensors and scanners. There's no real difference between a "sensor" and a "scanner," but a working distinction is that a sensor is treated as a device that operates once (but which may be used repeatedly), while a scanner is a device that typically operates constantly until turned off. Modes: The key difference between an active and a passive sensor is that a passive sensor can observe objects or energy sources by detecting reflected or emitted radiation, while an active sensor observes objects by detecting artificially generated radiation directed at and reflected from an object. Probes: Probes are automated spacecraft typically carried aboard larger starships to support exploratory, reconnaissance, or covert study objectives. The type and number of probes carried are dictated by the ship's size and mission profile. Now that I've described many of the phenomena and sensors available in Star Trek in excruciatingly painful detail, let's consider how these things might be usable in Star Trek Online. The most common references to shipboard sensors in Star Trek come in three forms: long-range scans, short-range scans, and internal scans. Long-range scans are usually performed in order to see what's ahead of the ship for the next few light-years: stars, major interstellar phenomena, and any anomalous high-energy sources that might indicate the presence of space-based structures or starships. Because of the great distances involved, long-range scans use only the ship's passive sensors, which detect very energetic particles and emitted or reflected energy sources. Finally, there is the special case of performing an internal scan of a ship. This is normally a tactical usage, so I won't go into detail on how it might work. But it's another key usage of a ship's sensors, and needs to be represented as an available option. I'll discuss short-range and internal scans in slightly more detail later. For now, to get a sense of how sensors might be used in Star Trek Online let's consider how a player might operate long-range sensors. For the discussion that follows, I've created a diagram that shows a very bare-bones example of a typical use of long-range sensors. Note that this diagram doesn't include many of the controls that would be necessary for an actual game. It's not intended to be a complete set of visual requirements; it's just an attempt to represent visually the basic features of a sensor system in a Star Trek MMORPG. As this diagram shows, we're currently performing a long-range scan with active sensors on to pick up additional information on any nearby objects. If active sensors are on, they are represented in the sensor schematic area by a smaller medium-gray cone extending in front of the image of the player's ship. In both the passive and active sensor cones, the intensity of all received information is averaged, showing "hotspots" where energy sources or objects are detected. 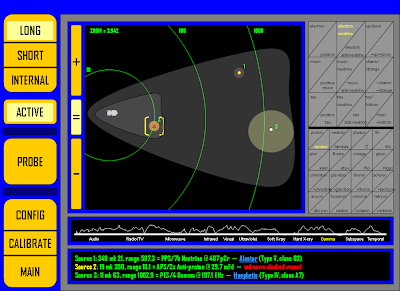 If the ship's computer is working, and if it has data on that area of space, and if the information returned is sufficiently detailed (this might be conditioned by both the player character's skill level with sensor operations and the number, power, and quality level of the ship's sensors), then the ship's computer may be able to provide specific information about what it detects. This information will be provided in the text output area as a description of the object or energy source. Detailed sensor information can also be represented graphically in the sensor schematic area in two ways: first, the area from which detected particles or energies seem to emanate is shown as a large circle overlaid on the schematic display, where the size of the circle indicates the relative intensity of all information detected from that location. (Active scans from other ships might make them light up like a bonfire!) Second, the source of the sensory input is represented with an icon whose shape and color provide additional information about what the computer guesses might be emitting those particles or energies. For example, a star might be represented as a small circle, where the color of the circle indicates the spectral class of the star. (Note that unless a ship's computer is malfunctioning or its stellar cartography database has been damaged, all ships traveling in known space should always know the location and type of all stars. This is information that is readily available to today's ground-based telescopes.) Similarly, nebulae might be shown as small squares; starships as points-up triangles, starbases as points-down triangles; and so on. In addition to telling the player which particles are currently detected, this area also lets the player control which specific particles he or she wants to focus on detecting. (Trying to detect everything might lead to an overly-busy schematic area.) By clicking on a particular particle type, the sensor schematic area will display only sources of that particle. Finally, at the bottom of the long-range sensor display is the text output area. This is where the computer (if it's working!) will place its textual interpretation of the sensor information received. As shown in the Excessively Complete List of Star Trek Phenomena above, the computer will "know" for example that if verteron particles are detected near a star, there's probably some kind of technologically advanced civilization there because verteron particles can only be produced artificially. A good computer would then provide a text cue to the player that maybe there's someone interesting enough to visit there. I've put some examples of this kind of interpretive text into my sample display output, but don't take it too seriously as a suggestion for what you might actually see in the game. It's just intended to give you some ideas of what the game might provide -- for example, stars could be hotlinks, which when you click on them bring up any available library data about that star system and its component worlds and lifeforms. The sensor schematic area can be zoomed in or out using the "+" and "-" buttons to the left of the sensor schematic area. When this action is taken, the sensor cones shrink or grow appropriately, and the green range bands will move to indicate to the player the changing relative distances of sensor information. (I've also indicated that there might be a text field in the schematic area to indicate the actual zoom amount, but it might be better placed elsewhere.) Between the "+" and "-" buttons is a "=" button, which immediately zooms the long-range scan display to the "1.000" zoom factor, showing the entire scan area. Players will be able to shift back and forth between these scan modes. When a player switches to long-range scans, the sensor schematic begins in Normal mode. If the player clicks and drags the mouse in the sensor schematic area, this creates a highlighted "sensor box" and places the display in Target mode wherein more detailed information about any object in the sensor box area is displayed. From either Target mode or Detail mode, the player may enter Pinpoint mode by performing the other kind of selection. If in Target mode (i.e., a sensor box has been drawn in the sensor schematic area), selecting a particle or EM band to watch for will shift the long-range scan into Pinpoint mode. The same is true if some particles or EM bands are being watched in Detail mode and a sensor box is drawn in the sensor schematic area. Finally, the player may have the option of selecting, configuring (possibly), and launching a probe to obtain detailed sensor data on a detected object. As I imply in my diagram, the player would press the "Probe" button, enter any config changes, select a target object, then confirm the probe launch. It might be fun to watch the sensor data change in real-time as the probe streaks toward its destination. Once there (assuming it's not destroyed en route), all sections of the long-range sensor display would be updated as though the ship itself, with all its sensors, was at the targeted location. In Pinpoint mode, it may be possible to obtain detailed long-range scan information. However, to obtain the most detailed and completely analyzed information, the player will need to switch to short-range scanning. 1. Click on the "Short-range" button on the left-hand control panel. 2. Right-click on an object in the long-range schematic area and select "Short-range detail". 3. Double-left-click on an object in the long-range schematic area. I haven't put together a diagram of what the short-range display might look like. (I might do that eventually, or not.) I would expect, though, that it would show the area near the ship in a schematic way (not a photo-realistic way -- that's what viewscreens are for!) in one area, and have a large text area for showing detailed high-level information about any objects selected. For example, the short-range scan is probably how Data was able to quickly determine how the Earth in Star Trek: First Contact was populated: "Approximately nine billion... all Borg." Short-range scanning would also be useful for studying newly encountered starships to determine something about the species operating them, as well as their technology level and their weapons and defenses, although this last would typically be a scan performed by a ship's Tactical officer. Lastly, there is the internal scan. This is another type of scan that would normally be performed by a ship's Tactical officer, but it's something that an Ops officer might need or want to do as well under certain circumstances. Internal scans are typically performed to locate intruders, or to isolate the location and/or type of some kind of anomalous energy or particle reading coming from somewhere inside the ship. Probably the best way to represent this (as noted earlier) would be to display a top-down (plan) and side (profile) view of the ship's Master Systems Display (MSD) diagram in a schematic area, along with the particle and EM detector/selector tools from the long-range scan display plus some kind of lifeform analysis tool. These would allow the player to pinpoint the location and type of pretty much any person or thing on board one's ship, such as an intruder or a subspace microfracture or other bit of treknobabble. Again, the game might let the ship's computer perform the analysis of returned sensor data, or it might let that be something that players or player characters are enabled to do. The point behind all of this was not to try to create an absolutely complete working gameplay system for how players will use sensors in Star Trek Online. 1. Collect all the known Star Trek phenomena (and some of the tools) in one place. 2. Suggest a visual mechanic for selecting and displaying information on many of these phenomena. More than anything, what I'm hoping is that putting all this information in one place will inspire some of you to come up with more specific ideas for gameplay. How could a system like this be used for exploration? for diplomacy? for combat? What kinds of missions could be written that take advantage of such a system? How should this system allow players to do science? How should Science or Medical character abilities affect the kinds or qualities of scans that can be performed? What about Engineers and Tactical officers? What are some ways that they might be able to use a ship's sensors? I hope that someone out there will enjoy the information and ideas I've put together here, and will carry on with your own ideas. Alright, I haven't read all of this, but I can see the work you put in here and I can't BELIEVE that there is not a single comment. I'm probably going to read this if I have the time, because dammit, it's awesome and I like it! I've always tried to imagine the perfect Star Trek game which is ACTUALLY scientifically correct(ish) and true to the show in how it SHOULD function. Creating this was a lot of fun -- I'm glad you enjoyed it. I built this while the Star Trek Online MMORPG was in development, first by Perpetual, then by Cryptic. If you've seen what Cryptic actually created, it's obvious that their view of what an online Star Trek game should be is radically different from the design thinking behind my Sensors notions presented here. I don't say they were wrong, exactly. We know now (as some suspected when we saw the beta) that STO was adapted from the code for Cryptic's Champions Online superhero game. This explains why characters in Star Trek Online are built around magic-like "powers," as well as the emphasis on ground-based combat. Time and money are always hard to come by, so perhaps Cryptic's approach is understandable as a practical necessity. Still, I never thought the idea of implementing complex, powerful starships as basically horses has ever properly represented an important element of what makes Star Trek fun, which is the connection of a crew to their complex ship as basically a character itself. In part, this detailed exploration of how sensors might work in an online Star Trek game was intended as a rebuttal to those who claimed that this kind of cooperative, tool-using, discovery-oriented gameplay couldn't be fun. The most vocal proponents of that position liked to say, "It's not going to be a starship simulator!" Sensors and Star Trek Online was my way of saying, "Why not?" Maybe someday someone will make that game. Until then, I really appreciate your taking the time to let me know you enjoyed this essay. If you really liked it, you might also enjoy some of the many other Star Trek game design pieces scattered around this site. :) I put a couple of my favorites on the sidebar here, or you can click on the Star Trek and Star Trek Online keywords for a full list of related pieces.